Expectations are a tricky thing. 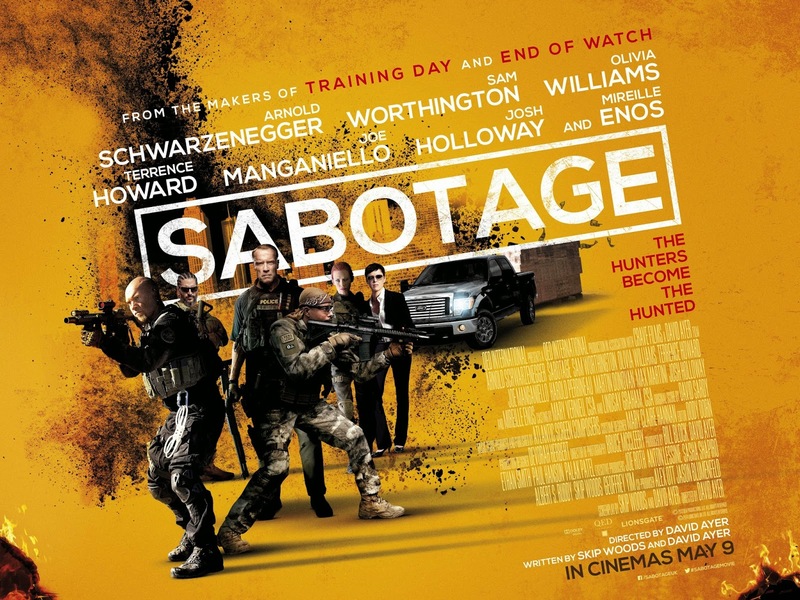 I went into David Ayer's Sabotage expecting—hoping for—a mindless action movie. It didn't have to be on par with The Raid, I merely wanted something better than other disappointing entries we've seen this year, from 3 Days to Kill to Brick Mansions. Unfortunately, while Ayer handles his action scenes well, no amount of cinematic bloodshed would be enough to make me want to spend another second with these infuriatingly immature idiots. After almost two hours of objectifying women and reinforcing negative gender stereotypes, these characters all deserved much worse than what was coming to them. Maybe it's on purpose. Maybe it's an attempt to portray the reality of undercover police work. Maybe it's supposed to be a critique of state-sanctioned violence. I don't care. With scene after scene depicting these characters as sexist, homophobic fools (there's seriously a recurring fart joke), I find it hard to care about what happens to them or anyone else in their stupid, annoying, intolerant world. There's nothing satirical about the film's whole-hearted embrace of police violence, and in our current cultural climate that's a real problem. But there's another problem with Sabotage: if it were just a bunch of knuckleheads blowing up a series of cars, buildings, and other human beings, that would be fine. But it actually asks you to care about these people. And each time the script asks us to feel something for these jerks I found myself staring at the screen dumbfounded. These people clearly don't care about anyone else, why should I care about them? It doesn't help that, as the plot opens up like a series of increasingly diminutive Russian nesting dolls, it eventually becomes apparent that there's not going to be anything inside. Olivia Williams provides a single point of moral stability, but as the only character with any redeeming qualities she's not enough to redeem this pile of garbage someone gave $35 million and called a movie. Alright, let's take a step back for a second, because there are a few small needles of enjoyment in this sinful, depraved haystack. The SWAT-style home invasion scenes are well orchestrated and combine the 80's "action team" aesthetic with a bare minimum of character development to keep them entertaining from a technical standpoint. While most of the fight scenes are too filled with digital blood splatter to take them to the level of homage, there are also a few rather effective R-rated visuals. I just wish there were more of that and less of them getting drunk and trashing strip clubs. I'm not even kidding: there's literally a scene which serves no other purpose than to witness this shameless display of machismo as they throw beer bottles on the floor and disrespect their servers. I'll admit I laughed at exactly two of the film's jokes and liked the ending a bit in spite of myself, but no amount of small pleasures would be enough to make me want to hang out with these overgrown children ever again. It takes a lot to make me hate a film, but for once Sabotage finds itself up to the task.